Ding dong the tar is gone! At long last I have original oak wood floors in the kitchen. It all started innocently enough... when we bought the house, there were clay tiles in the kitchen. I didn't mind the style of the tile and since we were leaving the kitchen largely untouched I was going to leave it. Butttttt, there were two broken tiles and I thought well, heck, we know there is hard wood, so we'll just knock out the tile and expose the hardwood. All the tile came out. Then came the first major dilemma, there was half inch thick plywood underneath the tiles that had been installed to adhere the clay tiles to. Well, the carpenters jumped in and helped me unscrew approximately a few hundred (no exaggeration) screws. We didn't know what damage the screws had done to the hardwood below, but we wanted the plywood out regardless since it made the floor uneven from the rest of the house. So out came the plywood. Aaannnddd then one layer of sheet vinyl and one layer of laminate tile with tar backing was revealed. I spent hours hacking at the vinyl and laminate. It was time consuming, dirty and mostly annoying. But darn it, I knew there was hardwood under there, and since it was visible in patches, I knew that it was in salvageable condition. The screws had done minimal damage. After the vinyl and laminate came out I was left with a thick layer of tar. Seriously! I know at some point someone was thinking to themselves, "Wood floors in the kitchen, who wants that!? I will do them a favor, let's lay down laminate tile. But we don't want it coming up, so lets make sure we do it right. Put down some more tar, make sure those babies stick!" Whew, anyways, I will give all the previous owners credit, none of them skipped a step and did shoddy work. Nope, every single change was done well and made to last. Good for them, bad for me! But I am not complaining. The house has been kept in original condition throughout most of the house and the few changes that I am undoing are mainly artificial, so it could be so much worse. The tar had me stumped. I had googled it, and being aware that it MAY contain asbestos, I was taking as many precautions as possible. I tried boiling water, both directly on the tar and also pouring it on a towel on the floor and letting it set. Nope, didn't work. I tried a Dremel saw with a scraper on it. Nope, didn't work. I didn't try any chemicals because my carpenters said that it would soak into the wood and prevent any stain or sealer from properly adhering. Then came the day I had to leave. I had a meeting in Sioux Falls. I had been working on this floor since October when I took out the first tile. The carpenters and I had a brainstorming session and we decided that while I was gone they were going to try a couple different techniques. Low and behold a couple hours into my meeting my carpenter sent me a video of the tar coming off! They ended up using a large sander and had to take it slow and easy because the tar gummed it up, but eventually it all came off. I am so happy and relieved that this process is done! I couldn't get a very good picture of the wood floors yet, because the kitchen is in full demo mode right now. Oh yeah, did I mention that to get the tile out, all the kitchen cabinets had to come out? And since the cabinets were out, I might as well rearrange the lay out, so it fits better for me, right? And if I'm going to rearrange the layout, then I'm going to need new countertops to fit it, right? Yeah, that snowball effect people talk about in remodeling, it's real. So this is what the kitchen looks like right now. I am going to paint the existing cabinets (you can see one upper cabinet in the top right corner the rest are currently in the dining room and living room!) and reuse them. I already purchased the appliances. I bought a super affordable package that is super cute and stripped back to the basics. 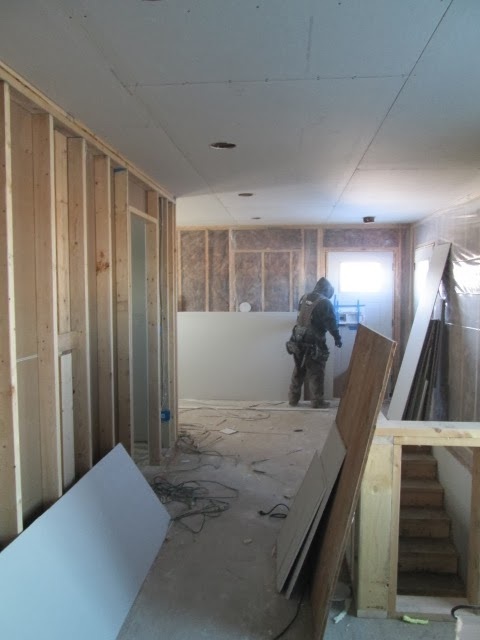 The sheetrock is going up now in the additions. It is awesome and exciting to see it transform from stud walls to sheetrock! And finally this is what she's looking like from the outside. See that little stud wall on the right? That is the garage wall going up. I took this picture a couple days ago and since then, the garage is now all framed out and the roof trusses are up. If the house didn't already seem ridiculously huge and mcmansion-ish, it certainly does now! This process has been a crazy whirlwind and to see it finally taking shape is rather surreal. But let me tell you, all I want for Christmas is that beautiful house right there! Thanks for stopping by! I hope you all have a Merry Christmas and enjoy your holidays!